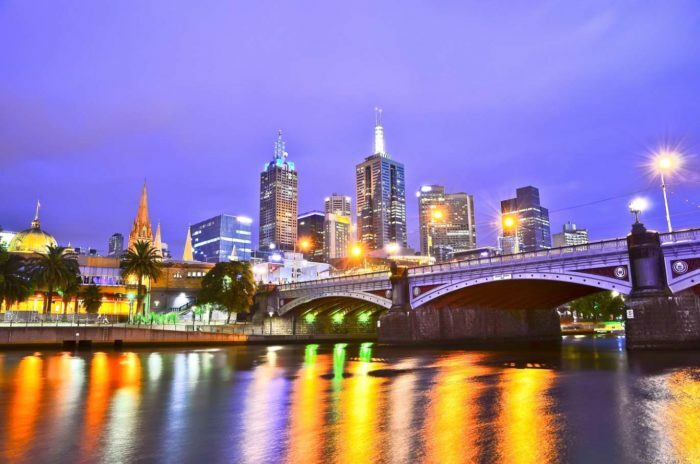 Melbourne, Australia, is arguably the best city in Australia. Many people feel that Sydney is the best, so there is a big rivalry. Whichever one you prefer, you should still see both cities to get a feel for each one. Attend a Footy game: Footy is the most popular sport in Melbourne. The stadium in which the games are held is called the MCG. Even if you have no idea what is happening in the game, it is a really fun atmosphere. Tickets are not too expensive for most games, so take a look and try to get into the action! Hosier Lane: The contained graffiti on Hosier Lane, near Federation Square, is a spectacle to see. The art changes often, so you never know what you will find. Local artists spray-paint the laneway, and there are hundreds, if not more, works of art to view. Penguins at St. Kilda: There are wild penguins that live in the rocks at the end of the largest pier on the main beach in St. Kilda. These penguins swim all day and return home to the pier each night at dusk. Wait down by the rocks and look around for these adorable miniature penguins. This is a great activity for all ages, and it is FREE. Albert Park: This park has an enormous lake and surrounding parklands that make it ideal for walkers, bikers, and runners to take some time to exercise and admire the views. With the city skyline in the distance, it is a gorgeous place for a picnic or barbeque. You can access it simply by hopping on a tram. Royal Botanical Gardens: There seem to be botanical gardens in every major city around Australia, but Melbourne’s are especially beautiful. In the warmer months, you can buy a ticket to see a movie within the gardens, and there is a concert hall nearby as well. There are many species of plants, so it is a beautiful place to take a long walk through on a sunny afternoon. Chapel Street: Great for higher-end shopping and brunching, Chapel Street has a lot of cute and quirky stores. A night-club haven by night, this beautiful street is high-class during the day. Even if you are only window-shopping, this street is worth a look! Hardware Lane: This laneway is very different from Hosier Lane. This one is cobblestone as well, but instead of graffiti, there is a restaurant after restaurant lining the road. The food is good, the atmosphere is fun, and it is worth stopping by for a meal, or at least a coffee (which Melbourne makes very well)! Fitzroy: This hip neighborhood boasts unique bars, great food, vintage clothing stores, and street art. Check it out both at day and night to experience all this area has to offer! Melbourne Museum: Exhibiting a bit of everything, the Melbourne Museum has a diverse collection sure to intrigue just about anyone. From Aboriginal history to an outdoor rainforest, it is an interesting place to learn a bit about many different topics. Next articleHAIR COLOUR FOR INDIAN SKIN TONE –DECODED!